Rahul Gandhi's interviews to Gujarati TV channels aired on Wednesday on the eve of final phase of the assembly elections sparked a complaints by the Bharatiya Janata Party and the Congress with the Election Commission which sought his explanation for "prima facie" violating the poll rules. As the BJP and the Congress were locked in a war of words over the interview, the Election Commission issued a show cause notice to the Congress president-elect to explain by 5 pm on December 18 as to why action should not be taken against him. Counting of votes is due to be taken up on December 18. The poll body in its 2-page order also said it will decide the matter without any reference to him if he fails to respond to the notice. The Congress too petitioned the Election Commission for action against Prime Minister Narendra Modi for addressing an event organised by an industry body on the eve of the final phase of the Gujarat polls where he attacked the main opposition party. Sharma said the EC should remain non-partisan. 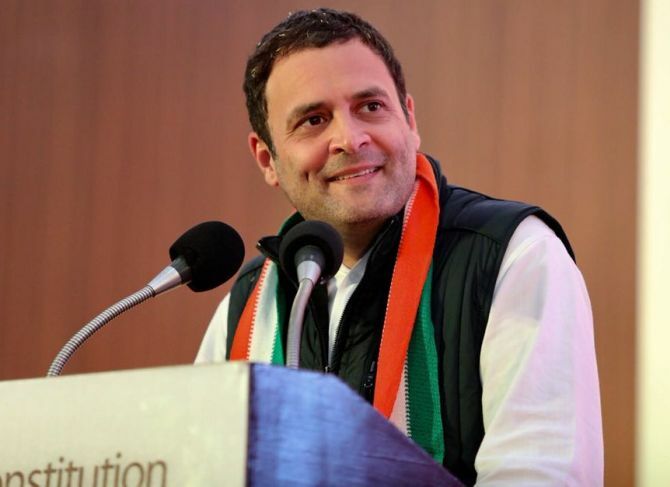 In a press statement earlier, the EC said it has asked TV channels to "forthwith stop" airing interviews of Rahul Gandhi as they violated the election law and directed the Gujarat poll authorities to lodge FIRs against anyone for infringement of legal provisions. It said Rahul Gandhi talked about the Gujarat assembly elections in which the polling for the second phase will be held on Thursday. The notice said display of his interview by channels falls within the definition of ”election matter” under Section 126 (3) of the Representation of the People Act, 1951 and display of such election matter within 48 hours ending with the hour fixed for conclusion of poll, amounts to violation of the prohibition contained in Section 126 (1) (b) of the Act, 1951. "...by giving such interview and its display on TV channels on December 13 you have, prima facie, violated the...provisions of para 1 (4) of the Model Code of Conduct, Section 126 (1) (b) of the Representation of the People Act, 1951 and Election Commission's lawful instructions in this regard," it said. The BJP in its complaint alleged that Rahul Gandhi has turned so "desperate" fearing defeat in the Gujarat polls that he "violated" the Model Code of Conduct to giving the media interviews. The Congress on its part accused Chief Minister Vijay Ruapani and others of threatening journalists for airing Rahul Gandhi's interview and urged the Election Commission for action against them including registration of cases. The Congress memorandum said: "The Election Commission is duty bound to be fair and impartial. We have to regrettably state the apparent discrimination and an apparent advantage being given to the ruling party miltates against this notion." It also requested the poll body to immediately withdraw its order directing registration of an FIR against news channels for telecasting the interview of Gandhi. "New norms for justice by ECI-: FM, BJP leaders hold a PC in Ahmedabad and release Manifesto on December 8 - No FIR. Modiji does 4 public meetings in december 9 - No FIR. Amit Shahji does a PC at Ahemdabad today - No FIR. Piyush Goyalji does 2 PC’s today - No FIR. Rahulji’s interview - FIR. Jai Ho!," Surjewala tweeted. Chief Electoral Officer of Gujarat B B Swain told reporters in Gandhinagar earlier in the day that a report will be submitted to the Election Commission of India. While the BJP claimed that airing of interviews today was a "clear violation" of the poll code, Swain said the rules and guidelines which prohibit campaigning in the 48-hour period before the end of polling do not amount to a "gag order". "There are rules and guidelines which ban broadcasting of certain election-related content on TV during 48 hours... But we can not call it a gag order. "Yes, we have received a complaint. We will acquire the CD of interview(s) and watch it to decide whether it has violated various provisions of section 126 of the Representation of the People Act. After that we will convey our opinion to the Election Commission," Swain said. Section 126 relates to prohibition of public meetings during period of 48 hours prior to the end of polling. "We filed three complaints, through e-mail, with the EC as well as the Gujarat Chief Electoral Officer, yesterday and today, as we came to know yesterday itself that such interviews will be aired today. Though we sought immediate action, the interviews went on air," said a state BJP leader who did not want to be identified. As Gandhi spoke about Gujarat in these interviews, it was a clear violation of section 126, he alleged. Union minister Piyush Goyal said the Election Commission should act following these interviews and claimed that the undercurrent which Gandhi said was present in Gujarat, will work against the Congress and the BJP will win over 150 seats in the 182-seat assembly. "The Congress is so scared and Rahul Gandhi is desperate to save his face. That is why he violated the Model Code of Conduct and gave interviews. We don't think such interviews are allowed in the 48 hours prior to polls. We have never given such interviews," Goyal told a press conference in Delhi.